But the adventure is just beginning. Nocturnal animals are beginning to stretch and yawn and think about the night’s activities. Our spotters and guides will find the smallest eyeballs possible hiding in foliage as our Land Rover passes by. What will it be? A flap-necked chameleon? Here’s the little guy we saw. You can barely see his yellow eye hiding behind a leaf. Each twist and turn along the dirt roads in the national park could reveal a stalking leopard, an antisocial civet, or the elusive aardvark. Night or day, the game drive and walks teach us to really look and observe and not just watch the scenery go past as we would at home. Safari on the River (www.safariontheriver.com) gives you a taste of Zambia and a chance to bid on an exotic, adventurous and, believe it or not, pampered African safari. Tickets are going fast. Buy yours today and join us at Juluka Landing on the Sacramento River on Sunday, September 26, 2018. 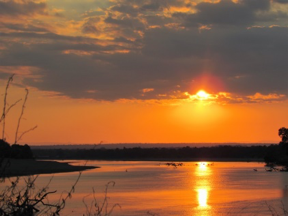 You can pretend you’re in Africa for an evening where we’ll transform a spot in Sacramento into a taste of the South Luangwa National Park in Zambia. Shop in our marketplace where we’ve handpicked truly unique Zambian goods, or join in the lively auction that helps us educate the youth and protect Zambia’s wildlife.